People were wanting Vancouver Whitecaps’ home games to be more entertaining, but be careful what you ask for, for you might just get it. The Whitecaps were forced to come from behind once again in a six goal thriller against New England Revolution. In a match that had drama from start to finish, Cristian Techera hit a second half hat-trick and Kei Kamara had a pair of horror misses in front of goal, as the ‘Caps made it four draws in a row and dropped more points at home. The visitors were never behind the whole afternoon, but some terrible defending from both teams made for an open game. Entertaining yes, but not conducive to kickstarting the Whitecaps climb back up the table. Carl Robinson rang the changes once again, with both fullbacks and wingers switching out from last week’s draw in Dallas. The biggest surprise though was reserved for the centre of the defence with midfielder Aly Ghazal dropping back to replace Jose Aja and partner Kendall Waston in his last match before heading off to the World Cup with Costa Rica. And it wasn’t to prove be a great day at the office for the Egyptian, nor for striker Kamara. 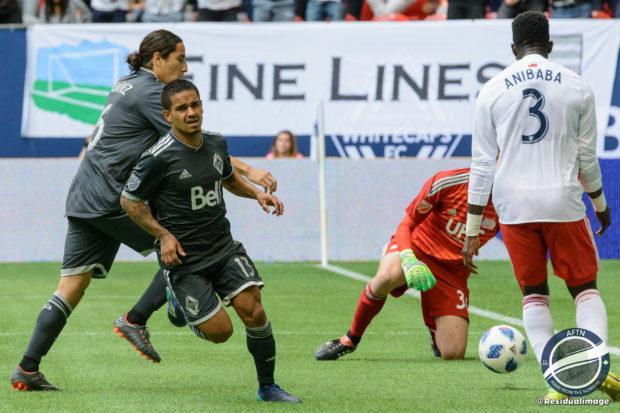 The Whitecaps should have been ahead in the opening seconds when Yordy Reyna hit the byeline and crossed the ball in on a plate to Kamara three yards out in front of the goal. It looked harder to miss, but the striker took a poor first touch, allowing three Revs defenders to cut down his option and he ended up firing weakly straight at New England keeper Matt Turner. It was a horror miss, but it wasn’t to be his only one of the afternoon. The Whitecaps were looking the more dangerous of the two sides, but the action was flowing from end to end, when from nothing, the Revolution took the lead in the 26th minute. Cristian Penilla headed up the left wing before hitting the byeline and crossing the ball into no-one in particular in front of goal. Unfortunately for the ‘Caps it found Ghazal and the midfielder’s attempted clearance saw him slice it high into his own net past Brian Rowe for the opening goal. Techera nearly responded right away for Vancouver but his long range dipper went wide of the right post. Kamara had a chance to make amends for his earlier miss four minutes before half time but he headed perfect cross over from six yards out and the ‘Caps headed into the interval trailing once again and needing to fight back in the second half. That fightback got even harder just thee minutes into the second half, when New England doubled their lead. Diego Fagundez hit a hopeful ball forward towards Penilla. Sean Franklin was tussling with the Ecuadorian and knocked the ball on, allowing the Revs midfielder to show his strength, easily get past and hold off the ‘Caps right back, and power into the box before slotting past Rowe and into the bottom corner. More individual errors were cost the Whitecaps dear. But 64 seconds later and the deficit was reduced back down to one, when Marcel de Jong sent a diagonal ball into the box and Techera swept it home first time from seven yards out to make it 2-1. It was a great cross from de Jong but one that saw him injured on the play and he was soon to leave the match. The goal brought some life not just to the BC Place crowd but also to the Whitecaps. They stormed forward and tied things up in the 51st minute, and it was Techera again that did the damage. Russell Teibert sent a ball in from the left and Techera’s initial shot was quite weak and straight at Turner. But the New England keeper spilled the ball. The rebound flew up into the air, and was the perfect height for the diminutive Uruguayan to head home the equaliser and send BC Place in chaotic scenes. Three goals in three minutes from both sides and the match was now well and truly back on, and you’d have been hard pressed to put your money on the winner. 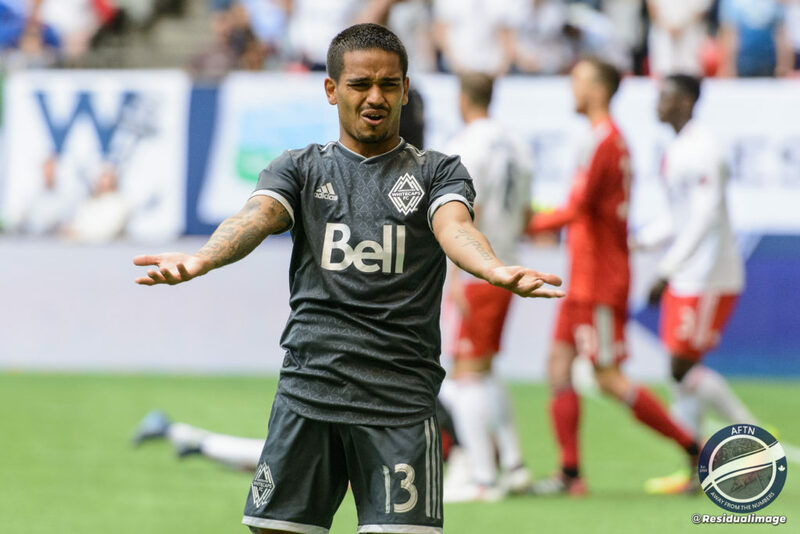 It felt that the Whitecaps were now clearly in the ascendency and Waston flashed a header narrowly wide, but Vancouver are going to Vancouver and more poor defensive play allowed New England to retake the lead once again just before the hour mark. A poor giveaway by Ghazal 20 yards out set up the Revolution and Fagundez sent into a low ball which Teal Bunbury gleefully dispatched for his sixth of the season, getting past every Whitecap in his path to ghost in unmarked and tuck it away. Crazy stuff and it wasn’t finished, with Kamara missing his second sitter of the game in the 61st minute, somehow sidefooting away an Alphonso Davies cross right in front of goal. The Whitecaps tied it up yet again in the 74th minute when Reyna crossed to a flying Bug who hit another first timer past Turner for his first ever career hat-trick. The ‘Caps pushed for the winner and came close to getting it when Felipe headed a Techera cross off the right post with Turner beaten, pretty much summing up the home side’s afternoon in front of goal if you weren’t the Uruguayan. New England had a late penalty shout waved away and the ‘Caps had a couple of half chances, but there were no more goals, and Vancouver had to settle for a point and two more points lost at home. That’s 11 points from a possible 21 dropped now by the ‘Caps at BC Place. With other teams picking up points all over the place, it’s going to be a tough ask for Vancouver to turn things around and make a concerted push for the playoffs. These early dropped points are going to be crucial down the line you fear and the ‘Caps are already in danger of getting left behind.